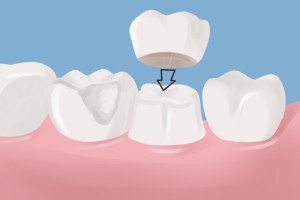 A dental crown is a tooth-shaped cap that is placed over a tooth that has become broken or is showing signs of serious decay. The crown can hold a severely decayed tooth together in order to prevent breakage, or hold a broken tooth together. They may also be used to support a tooth that has large fillings. They are also used as anchors for dental bridges, or to cover teeth that are discolored or misshapen. Your dentist will perform a full examination before placing a dental crown in order to determine how much damage has occurred to the tooth. In some cases, a filling may be placed first. In order to create the crown, your tooth or teeth will be numbed, and an impression of the tooth and surrounding teeth will be made. This impression will be sent to a dental laboratory where your customized crown will be made. A temporary crown will be placed in order to prevent any further damage to the tooth. While the temporary crown is in place, you will need to avoid food such as chewing gum, caramel, and crunchy foods such as apples or hard candy. Try to avoid chewing on the side of the mouth where the temporary crown is in place, if you can, and brush gently. Once your permanent crown has returned from the lab, your dentist will cement it into place with a special permanent adhesive. If you have any questions or feel like you may be a good candidate for a dental crown, please call Stonebridge Dental today at 972-547-0554 for a consultation. Our trained and professional staff can answer any questions you might have. We can repair your tooth in a timely manner and will have your smile restored to its best in no time at all.